I saw it again today, in another mock draft. I see it all the time. I see it so much that I’m sick of seeing it. To me, this is a lazy and tired piece of analysis. Is the answer to Buffalo’s quarterback needs really someone who will be suited for only 2-3 games a year? What about the other 14-15 games played in a dome or warm weather? It’s just as cold and windy in Chicago & New York & Boston & Philadelphia. But do those teams automatically have to draft someone to deal with their weather? You never hear that. There is no question that a strong arm should be a factor in the Bills quarterback analysis. Yes, arm strength can be an antidote to some of our weather, which no doubt will effect a few games. But it should not be anything more than one of many factors in a quarterback evaluation. I don’t want the Bills passing on a better overall player because they think they need the strong armed guy for a December home game. Having the strongest arm is never a guarantee for NFL QB success. It’s about so much more than that. If a quarterback is considered a first round draft pick, then that means his arm strength is good enough. The mock drafts and analysts seem to bypass Sam Darnold, Josh Rosen or Baker Mayfield to the Bills for no other reason than they aren’t perceived as “strong arm” guys or “cold weather ready.” Everybody puts Josh Allen in that category, and thus to the Bills. 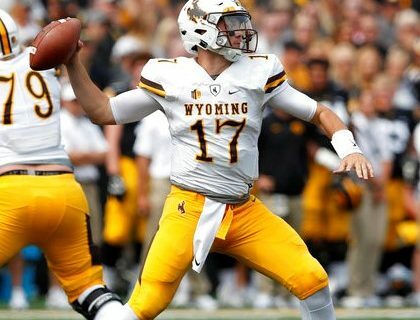 Did you know that Josh Allen only played in 1 snow game, 1 rain game and 3 cold weather games during his two years as a starter for the Cowboys? (Thanks for Wyoming radio color analyst Kevin McKinney for the details) This video from the Colorado State game is one of them. Does that make him a “bad weather” quarterback? How well is he really prepared to deal with WNY weather? In case you didn’t know, he’s from California, a native of the Northern California town of Firebaugh, CA. Speaking of the Golden State, the dreaded “California QB” is a negative in Buffalo, because people don’t think they can deal with the weather. I’ve been hearing that since Rob Johnson, J.P. Losman and Trent Edwards. Where they came from had nothing to do with their lack of success. They weren’t good quarterbacks, not matter where they were from. Aaron Rodgers is from California. He’s been pretty good in Green Bay. Brett Favre was another warm weather native who did pretty well on the Frozen Tundra. Tom Brady is from California. The majority of top QB prospects come from warm weather regions like the west coast or Texas. So do we want the Bills to ignore them, and wait for the next Midwest native to be a first round pick? Good luck, you’ll be waiting a long time. Scouts will tell you hand size has as much to do with dealing with bad weather as arm strength. Allen’s measured 10 1/8″, the largest among the four. That would be a positive on the scouting report. UCLA’s Josh Rosen measured 9 7/8″, among the largest of this year’s group and among the largest of the last 6 first round QB’s taken. The ability to hold the ball with bigger hands and eliminate fumbles, especially in cold weather, is why hand size is important. More so than arm strength or where they’re from. For anyone that points to the Bills needing a “cold weather” quarterback, I cite one of the worst weather games we’ve ever seen. Last season’s Bills-Colts game played in a lake effect snowstorm was as bad as it gets. Who almost drove the Colts to a winning touchdown at the end by throwing on every down? Florida native Jacoby Brissett, who played his college football at Florida and North Carolina State. Yes, a warm weather QB who plays in a dome almost beat the weather-hardened Bills. Draft the best quarterback prospect. Draft the one you believe is smart, hard working, a leader and accurate. Don’t worry about where they’re from, or whether they’re built for the weather. Do that, and the sun will finally shine on the Bills QB position no matter what the weather.